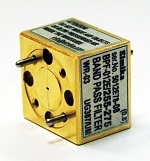 High-Pass (HPF series), Low Pass (LPF series) and Band Pass (BPF series) Filters are available, providing desired skirt selectivity and rejection levels with minimum insertion loss in the pass band. The filters are offered in all standard waveguide bands covering 18 to 400 GHz depending on our possibility to fulfil the customers' requirements. Dimensions of filters depends on required specifications. Please contact us for any questions. 1),3) Depends on required specifications like rejection level and skirt selectivity. 2) Depends on applied design technology. 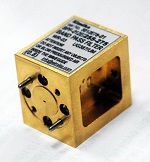 Band Pass filter with the pass band of 35 - 40 GHz frequency range, silver plated.